Matt Spaiser’s terrific blog: bondclothes shows the variety, and sartorial excellence of Ian Fleming’s master spy. We are particularly fond of the traditional blazer. On a number occasions Sean Connery’s Bond wears a single-breasted navy blazer. The navy blazer (with metal buttons, of course) has long been a staple of the classic American wardrobe, but of course it’s origins were in England. The English don’t favor the blazer as much as the Americans do, who will wear them on just about any occasion, casual or formal, business or social. The English adorn theirs with double vents (as seen in Bond’s examples) rather than the single vent that is most common on American blazers. A proper blazer is more than just a navy suit jacket with metal buttons, as is commonly seen in examples off the pegs. 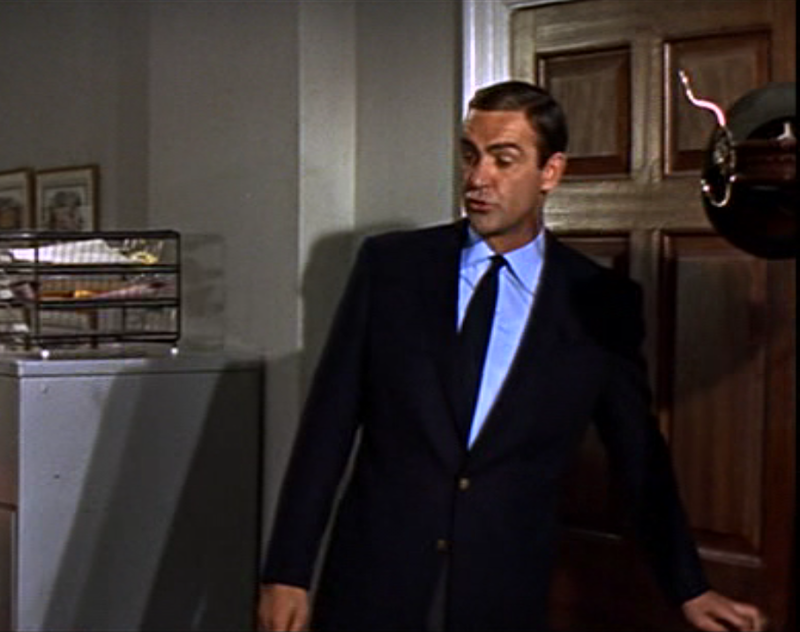 To further distinguish Bond’s blazers are, along with the metal buttons, swelled edges and three open patch pockets. Bond’s blazers are most likely made in a wool serge, which is typical of naval uniforms, the blazer’s ancestor. Another weave suitable for the blazer is hopsack. Bond’s blazers all have a 2-button front, the same as his suit jackets. 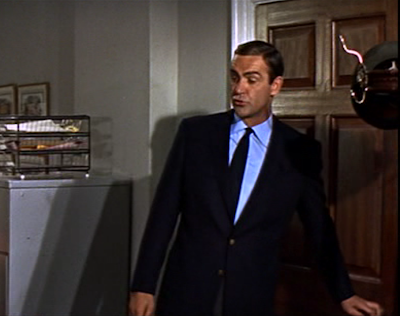 Bond wears navy blazers in Dr. No, Thunderball and Diamonds Are Forever. The buttons are gunmetal, brass and brass, respectively. In Dr. No there are only two buttons on the cuff, whereas there are four buttons on the cuffs in the later two films. 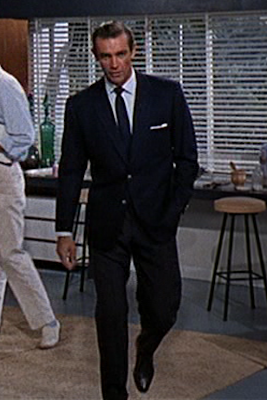 In all three films Connery wears his blazer with dark grey trousers, a light blue shirt with cocktail cuffs and a navy grenadine tie, and in Dr. No he also wears a white linen pocket square. The navy blazer is a versatile piece of a man’s wardrobe, just be sure not to overuse it.